Total closed length: 37 cm / 14.5 inch; bead size: 6 mm. 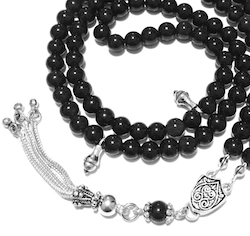 A tasbih made of high quality black obsidian gemstone and Turkish sterling silver parts. Professionally assembled for durability, this tasbih makes a beautiful gift as well as a valuable companion during the namaz prayer.